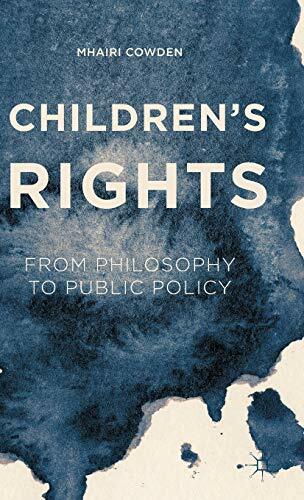 Children's Rights: From Philosophy to Public Policy by Mhairi Cowden is what the title suggests, a discussion in regards to children's rights from a philosophical perspective, which then lends itself to discussing public policies in place today. Cowden states that there is a lack of theory and thinking about children's rights as well as lack of explanation as to why children have rights in the first place. Starting the discussion then is a dialogue about what constitutes a child and what constitutes rights. Is a child a child based on age, based on cognitive abilities, sociocultural standards or biological distinctions? Why are children different from adults and why is this an important distinction to be made? Cowden explains various theories and ways of thinking relating to children, such as the notion of arguments based on incompetence (children's overall reduced capacities), based on legal rights as they exist in law, as well as through will theory and interest theory. Cowden builds on the notion of interest theory, and also explains in depth the issues of capacity and competence and why these notions are different from one another. Cowden then moves into discussing children's rights in practice, which includes the rights of children to develop their capacities. Cowden explains this notion in more detail "In order to overcome the future interest problem for children's rights, we must first show why the right belongs with children now and not with the future adult they will become, and second why it is that such construction should be a right" (p. 75). Moving then from a child's right to develop, Cowden discusses the child's right to know using examples of donor gametes, and the notion of moving to a system of non-anonymous donation. According to Cowden, two important factors to consider when talking about a child's right to know and donor gametes are those of the risk of harm, and out of respect. Cowden also writes about a child's right to medical decision making through the notions of informed consent, and competence and well being by using the examples of gender-dysphoria. Cowden then turns to the right to be loved, stating that philosophically, children do not have the right to be loved, as love cannot be a duty, even though one hopes that children are loved by their parents and caregivers. Cowden then summarizes the book's aims; that children have rights, that they also have limits in regards to their rights, that interest theory is a strong theory to use when discussing children's rights and that there is a clear distinction between competence and capacity. Cowden provides the reader with an interesting notion of children's rights through building on interest theory. Cowden explains such notions in an understandable way, but the book can become difficult at times as the main focus is that of philosophical theories, even though Cowden helps the reader navigate such theories and beliefs about rights by bringing in public policies and centering the discussion around contemporary issues.